Children love to play in the sand and therefore we have to provide them with a clean area. We make shade covers in many different shapes with galvanized chain links sewn into pockets at the perimeter of these covers. It is very easy for the Childcare centre staff to put it away. As there are no hooks our covers have no Trip Hazard. 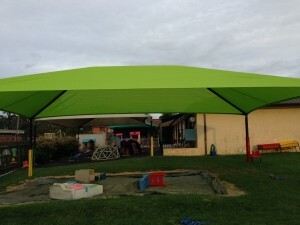 Some customers prefer to have these awnings as they could use them only when they need. We are able to procure and install a variety of Folding Arm Awnings and retractable Roofing Systems. Our technicians will check and advise you regarding the suitable fixing points for awnings as most awnings are quite heavy.